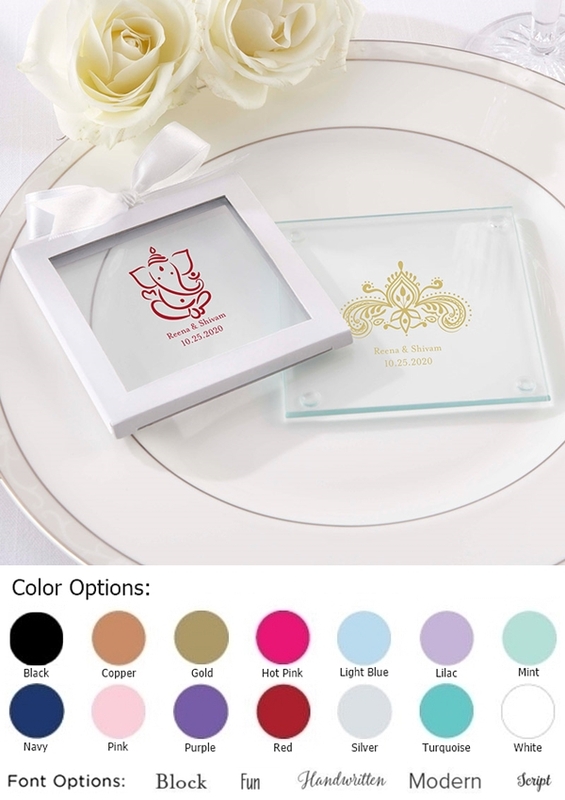 These square glass coasters are available in your choice of two exotic "Indian Jewel" designs (Ganesha or Henna-inspired) for your jewel-tone wedding, Indian bridal shower or Diwali celebration. Even better, the coasters may be customized with two lines of your custom text in your choice of 13 ink colors. PLEASE NOTE: Pictured gift sleeves are not included but are available for an additional fee. These coasters are sold as a set of 12 and prices quoted below are per set. Due to personalization, there is a design setup fee of $39.00 that will be added to your order at checkout. Please also note that while we package all personalized glassware with extra care, we cannot replace any glassware that may break while being shipped by UPS or FedEx. It's always a good idea to order extra quantity (5% is the rule of thumb) to account for shipping damage or unexpected guests.